Standalone Windows application programmed in Delphi - Graphical Installer Wizard. This application converts your existing Inno Setup scripts - so all your regular installers will become Graphical Installer Powered Installers. Also it provides Wizard for creating new scripts from scratch however only basic skeleton of installer will be created - but with all features from Graphical Installer Powered Installers. Wizard.exe must be in the same directory as file GraphicalInstaller_functions.iss, because it reads project's setting from it! Application must be configured before first run - see Configuring Graphical Installer Wizard. Run Wizard.exe - by doubleclicking on it or via shortcut in Start menu. Main window will open. There are many actions which can be performed from this tool. Every action is started from Main menu. Shows configuration dialog. See Configuration of Graphical Installer Wizard. Starts new Wizard - creating new scripts or converting existing ones. 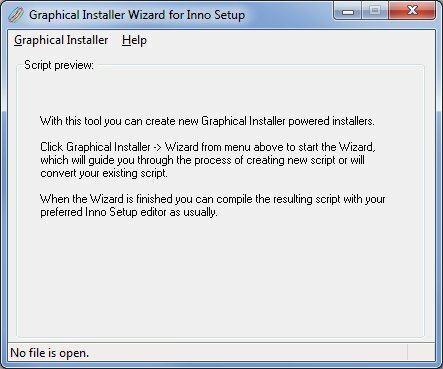 See Description of Graphical Installer Wizard's pages. Launches BitmapCutter - application for creating background images. See BitmapCutter.exe. Displays webpage http://www.graphical-installer.com/ in your browser.